Serious, but exalted in Bach.. These are her remarkable polarities. Depending on the weather, and internal environment, she can either raise you up, or let you down. But even with her intermittent note-lazy landscape, she will always sing heart songs. He sent me links to these that evoke the 50’s soap operas with those creaky doors and exotic sound effects. I’ll share Postcard 8 with Bach snippets and a Haddorff Christmas Carol. In this audio sample, he showcases the old world twangy Haddy, and the history of its Rockford, Illinois based manufacturer. Note the Swedish antecedents. “Congratulations on your recent acquisition! Haddorffs are, indeed, lovely, solid, dependable, well-built pianos. It looks like what you have is a spinet rather than a console? Does it have a drop action? Or, does the action rest on top of the keys? (Just curious…) I believe that by 1951, the Haddorff Piano Company was controlled by Kimball, though the pianos were still made to Haddorff specifications at the factory on Ethel Ave in Rockford, IL. Haddorffs have such a rich, full sound because of their unique soundboard design, and because of their large cast-iron plates that are mated to the pin-block in a special way (source: internet research, plus corroborated first-hand experience!… smile ). “It seems like every Rockford native that I’ve talked to who is over 60 years old has a Haddorff story to tell! I would love to collect some of these stories, and hope that I have time to collect them before that window of opportunity closes. “Did you happen to follow, or find, any of my series of “Haddorff Postcards” that I made last year? They were all posted in the Pianist Corner Member Recordings sub-forum. “Best wishes to you and your new find! Let me know how things turn out! The other member of the Haddy Haddorff cult is a new owner who commented at my blog site after I posted my first Haddy tribute. “My Haddorff Vertichord arrived yesterday afternoon in relatively good tune. It plays great and has that natural reverb or resonance that I was looking for. It looks good too, although the reddish tint of the mahogany has faded except for on the keyboard cover which didn’t get exposed to 70 years of light. I am the 2nd owner. 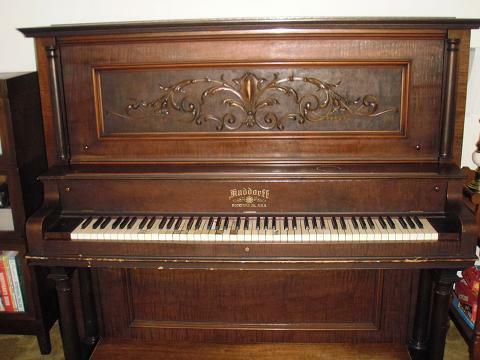 This piano was purchased new in Ohio and taken to Europe for 20 years and then back to California. There is only one key with some slight ivory damage and I will take your advice and have it repaired and tuned and regulated by one of our local local RPT’s. I would send a pic of “Haddy” (yes, I named the piano) from my I phone but I’m not sure how to post it unless I’m sending to an email address. As always, this cult welcomes new members, so if you own a Haddorff, please join us, and share your story. I was researching my upright grand Haddorff which I have owned for fifty years and which my mother bought from a second hand furniture collection in Eugene Oregon.. 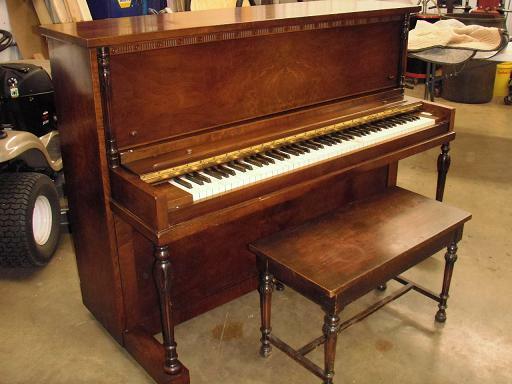 It is in perfect condition mechanically and as a piece of furniture, w/just a nick out of one of the ivories. It is burled dark wood, maybe walnut, with carving that looks like holly, and magnificent roaring lions for legs. I can’t play it very well, but have kept it as a work of art and an attraction for my friends who play the piano. It is so loud that you can hear it across the street with the door open so I store my winter blankets behind it to make it easier on those around me when I practice. I love it. Wonderful story. It’s nice to know of other Haddy owners around the country. Could you send me a pic? I will privately forward my e address. 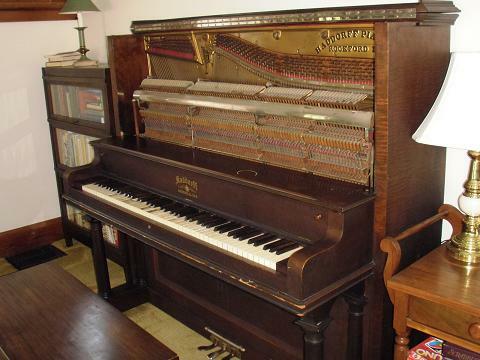 I have a HADDORFF VERTICHORD PIANO that was made in November 1942, I found that out from the serial numbers, I paid $300 for it at an estate sale about 20 years ago. It needs to be tuned and maybe polished. I would love to know how much it is worth? If someone can email me any information about it and cost would be great. I tried to attach a picture of it but it will not let me do it. If someone can help me there to would be great so someone can give me an approximate value of it would be great! This would be hard to assess not knowing the state of the hammers,shanks, inner assembly, soundboard. You need to get a registered technician to look at it, play it, detail it. I paid $700 for mine . and it’s a 1951. These older uprights and consoles tend to devalue with time..sadly.. there are a glut of them. Though the Chicago co. that manuf. Haddorff didn’t make that many. Still have a tech look at it. Can you reccomend a tech in the NYC area and also someone who can tune it? Mahanor) Contact, through her secretary. How sad! Is it an upright or console? Why don’t you add in the blog link, along with an ad –FREE piano. Maybe that will raise eyebrows about the well-made reputation of this piano. My Haddorff was given to a student when I relocated.. i could not keep three pianos in a small apartment. 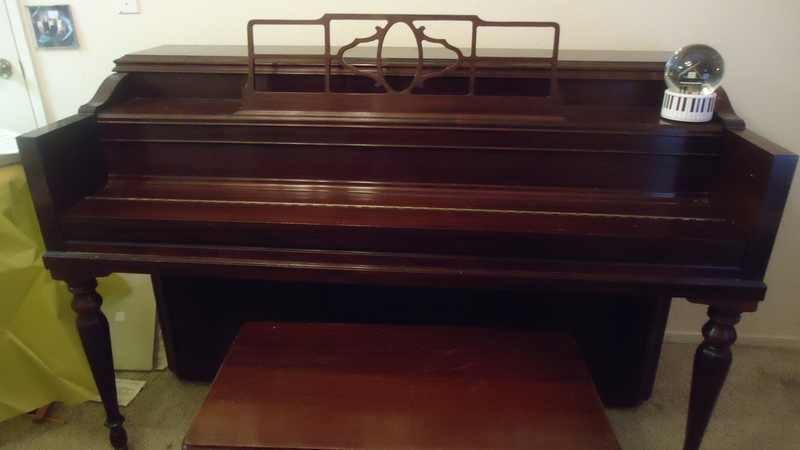 Is the piano in good playing condition? Has it been recently tuned?